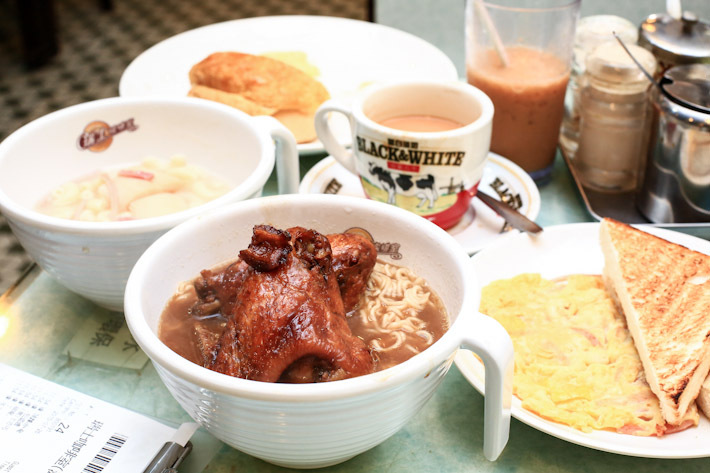 Everyone thinks of cha chaan teng when it comes to casual dining in Hong Kong. For the uninitiated, cha chaan teng is a no-pretense, fuss-free local eatery in Hong Kong that serves comfort food at affordable prices. These local diners are everywhere in Hong Kong and you will always find locals dining in those nondescript outlets. A cha chaan teng is not known for service, unfortunately. It is really a place where you eat and go, or do a few quick readings of your newspapers. That said, the essence lies in savouring a moment of local delicacy amidst the humdrum of the city life. A trip to Hong Kong is not complete without eating at Cha Chaan Teng. 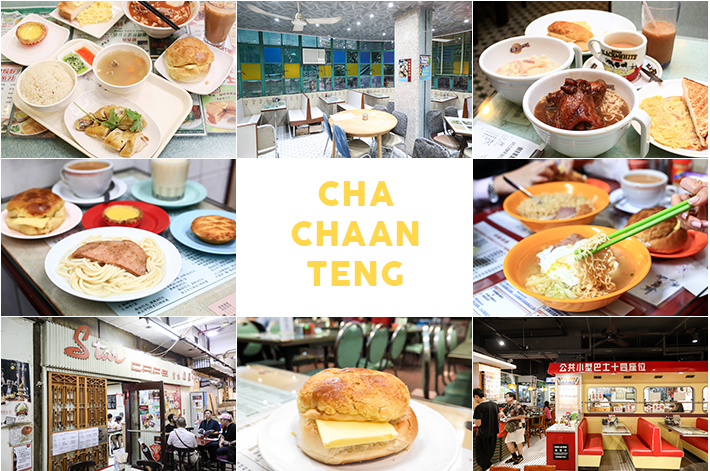 Here is our guide to the best cha chaan teng in Hong Kong that we can always count on for a good local meal. Australian Dairy Company is probably the first name that comes to mind when Hong Kong cha chaan teng is mentioned. Yes, you have to make a visit to the famous outlet in Jordan for they serve the BEST scrambled eggs and ham macaroni. Australian Dairy Company is very much a quick service restaurant; you are not meant to linger here. They operate with a ruthless efficiency: you order, eat, pay and go. And by the way, no service here at all. The staff (no matter which year, which month, which day you go) are all perpetually rude, grumpy and fierce. We got scolded for merely taking a photo of our food. Yes, you have been warned. Located on a quiet corner of Fashion Walk in Causeway Bay, Cafe Match Box is a retro-themed eatery where you can get popular cha chaan teng dishes. On the menu, you can find Baked Rice with Pork Chop & Pineapple (HKS$66), Three Treasures Rice (HK$56), Grilled Pork Chop (HK$133) as well as baked goods such as Bo Luo Bao (HK$9) and Coconut Tart (HK$9). Established in 1952, Hoi An Café is a charming old-school cha chaan teng located near to the Western Market in Hong Kong’s Sheung Wan district. It is known for its classic Hong Kong baked goods such as cocktail buns, pineapple buns, Swiss rolls and its signature coconut tarts. Not to be confused with Australian Dairy Company, Hokkaido Dairy Farm is another cha chaan teng that is frequented by locals. The menu comprises mostly sets—from Breakfast Sets, Noodles Sets to Sandwich Sets. While it does not have eggs as gratifying as Australian Dairy Company, the Breakfast Set is still worth a shot; it comes with fried eggs with toast, your choice of macaroni or spaghetti in soup with ham and a choice of Hokkaido coffee or tea. Hong Lin Restaurant is another popular haunt in Mongkok that locals frequent. There are both a dine-in area as well as a take-out counter. If you do not have time for a proper meal, grab an egg tart; it comes with a flaky, butter case and the curd is smooth and subtly sweet. For the mains, you definitely have to try the macaroni set (HK$43/ S$7) that came with a large bowl of beef macaroni in tomato soup, buttered toast, scrambled eggs and a hot coffee/ tea. The tomato soup was rich and thick; every sip was a joy. It came with many beef slices, and the side of buttered toast completed the very quintessential Hong Kong meal. Another of our favourite cha chaan teng in Hong Kong is Honolulu Cafe which has the best egg tart ever in history. Honolulu Cafe should be no stranger to Singaporeans since there is an outpost here on our sunny island, but dining at the original outlet elevates the experience. When at Honolulu Cafe, apart from stuffing yourself with egg tarts, do not leave without trying the Swiss Wings and Curry Fishballs too! 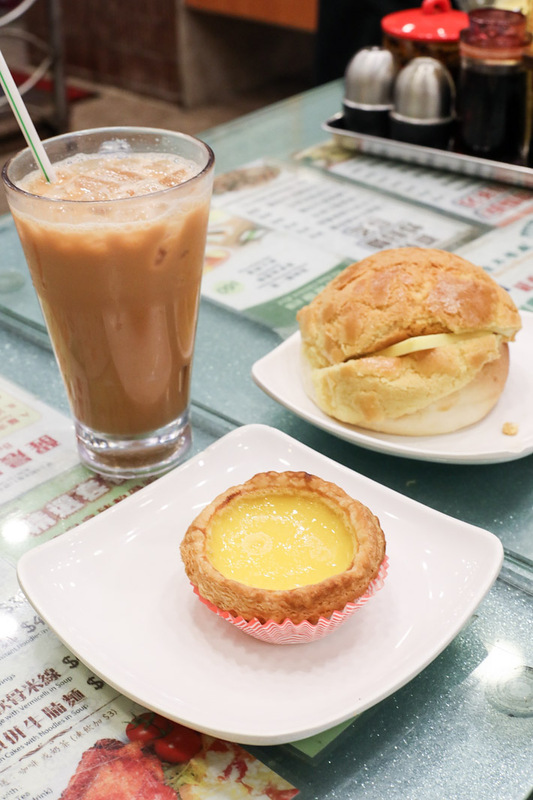 Kam Fung Restaurant is a local institution known for its excellent milk tea, egg tarts, baked chicken pies and Bo Luo Bao. The baked chicken pies, in particular, are phenomenal. The crust is super buttery and it simply melts in the mouth. It is to die for. If you are lucky, you’d get fresh batches that are just out of the oven—those are exceptionally warm and fragrant. Kam Wah Cafe has one of the best, if not the best bo luo bao in Hong Kong. The cha chaan teng is always crowded, but trust us when we say those pineapple buns are totally worth queueing up for. Founded in 1952, this Hong Kong institution is the place to go to for milk tea, pork buns and French toast. 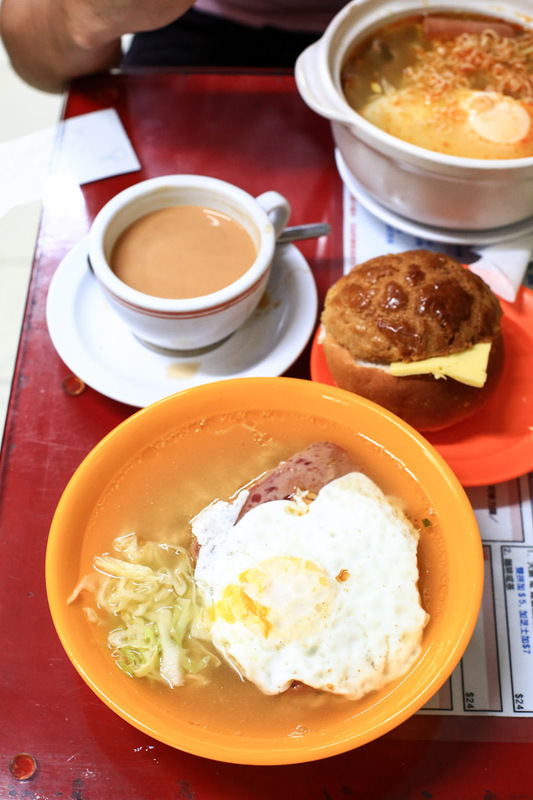 Come here for a no-frills, authentic Hong Kong cha chaan teng experience. Mido Cafe in Yau Ma Tei is one old-school cha chaan teng to visit when in Hong Kong. Untouched by time, the cafe seems to be at a standstill. You have your usual cha chaan teng fares—from baked rice to noodles, sandwiches to classic HK-style drinks. What you really have to try is the French Toast (HK$22). It is Mido Cafe’s most popular item and one that every first-timer to Mido Cafe must try. Two slices of soft bread coated with egg and deep fried to a slightly crispy texture then generously drenched in maple syrup, the French Toast definitely lived up to its hype. If you are in the Tsim Sha Tsui area, check out Relax For A While along Kimberley Road. The menu is big and there should be something for everyone. We liked their French Toast as well as the comprehensive congee menu. Otherwise, the fried rice never ever disappoints. Just look at the luscious gravy and generous ingredients! 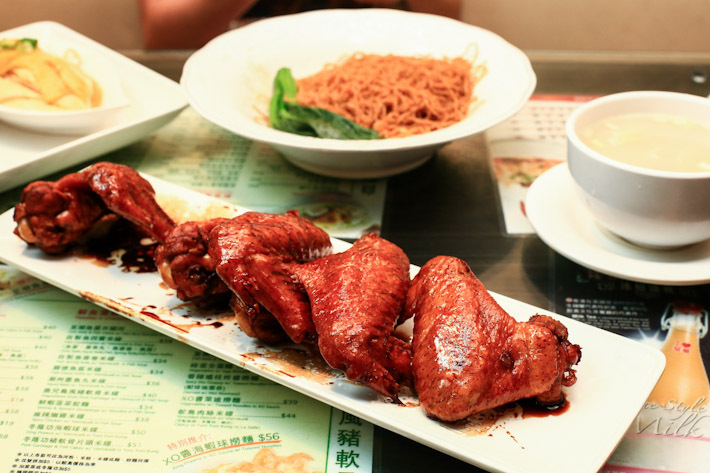 A popular Cha Chaan Teng that serves amazing roasted goose and the classic Hong Kong cafe food, Sham Tseng Chan Kee is our go-to place when in Mongkok. They have a few outlets but the outlet at Mongkok always entices us with its display of glistening roast geese. Yes, you definitely need a plate of Roast Goose Rice when at Sham Tseng Chan Kee. This underground cafe is hard to locate, but once you get there, you will be glad that you made the effort to track it down. Locals flock to Star Cafe for their signature tomato soup noodles with egg and luncheon meat. To find this place, enter Champagne Court B at 16 Kimberly Road, walk to the end and go down the stairs on your right. You will be on your way to a bowl of flavourful tomato soup noodles. Top-up for cheese for an extra oomph! Swiss Cafe sits on the second level of an unassuming building in Central and what you have to try at the cafe is its Swiss Wings. The Hong Kong-style style chicken wings are flavoured with a special sweet soy sauce, making every bite a joy. There is a Swiss Set at HK$45 that comes with a toast, ham omelette as well as Swiss wings with instant noodles. The most famous Cha Chaan Teng in Hong Kong is undisputedly Tsui Wah Restaurant. Locals and tourists alike flock to Tsui Wah Restaurant for their signature Hainanese chicken rice, fishball noodles, and Bo Luo Bao. One of the most impressive things about Tsui Wah is that it manages to maintain its high standards across all the branches. One of the most impressive things about Tsui Wah Restaurant is that it manages to maintain its high standards across all the branches. Definitely, a must-visit when you are in Hong Kong. If you find yourselves in Causeway Bay, you have to drop by Yee Shun Milk Company. It is most known for their smooth Steamed Milk—which is essentially a Hong Kong-style milk pudding. A bowl of cold Steamed Milk is what we always crave and you will never be disappointed by the creamy and slightly sweet rendition by Yee Shun Milk Company. Other favourites on the menu are pork chop bun and macaroni soup with fried egg and ham. For more recommendations, read our Hong Kong Food & Travel guides.